Blue Zephyr: What was the reason you decided to write Evangeline? It’s rather different from your other novels. It’s different, really, from any courtroom drama written by anyone. Blue Zephyr: So Evangeline was published first in Germany, and to considerable critical acclaim, as I understand it. But tell me… didn’t something happened that caused a stir with the sales staff, something that hadn’t happened before? 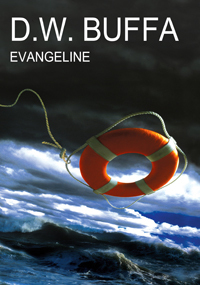 Blue Zephyr: Because the proximity of death is what Evangelineis all about? Buffa: Yes, that as well as what death means, and how we face it. ‘Evangeline’ is this astonishing sailing craft that can go anywhere, but despite all the technology it has, it goes down in a once in a lifetime storm off the coast of Africa. There is no time for anything except to try to get on board one of the lifeboats and then no chance of rescue. The run out of food and water. The question becomes who should die so the others can live. The captain, Vincent Marlowe, takes the responsibility for everything that happens. Finally, after forty days, when those who are left and themselves all nearly dead, they are rescued. Marlowe is charged with murder. Buffa: No, it’s a story about the things worth dying for, and, because it’s really the same thing, the things worth living for. Blue Zephyr: Thank you for taking the time to share the inspiration of Evangeline with us. We’re all looking forward to the release of the printed version in the U.S. and, on a personal note, I hope to see William Darnell come back in many novels yet to come. I think Antonelli fans will be pleased by your new character.